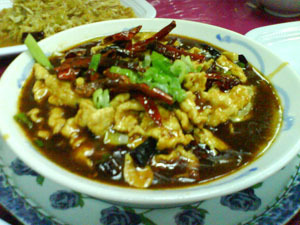 If you fancy food with a bit of spices try “Restaurant Dong Bei Cai – 东北菜”. Just like the restaurant’s name, it describes the origin of where the food comes from, which is the North East part of China. Here are some of the dishes that we tried, it’s really delicious. Excuse me, please let me jump queue for introducing the main dish first, cuz it’s really really nice. I personally like this dish a lot and it’s call “Spicy tofu cook with pork and assorted mushroom” or we call it “水煮肉片” in chinese. 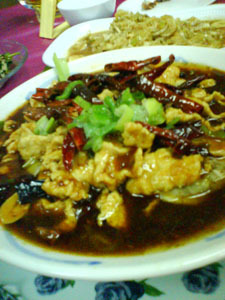 This dish serve in a big portion where u can share among 2-3 people. It’s a bit hot but at the same time it’s really delicious! 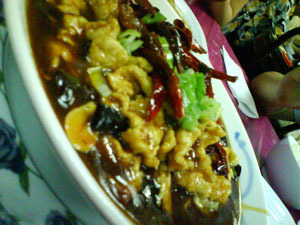 You are currently browsing the Yummy Corner weblog archives for May, 2008.